Is Paul Pierce Trying to Tell Us Something With His Red Sox Cap? Brooklyn Nets forward Paul Pierce didn’t speak to reporters when he cleaned out his locker Thursday, but Pierce’s choice of head wear might be a clue toward his future intentions. Paul Pierce (didn’t talk to media) went to clear locker today. He wore a Red Sox hat… Does he want a Boston return? Though Pierce, a free agent to be, walked through the Nets’ practice gym on the team’s breakup day without speaking to reporters, it was impossible to miss the 16-year veteran was wearing a Boston Red Sox hat that seemed to send a loud-and-clear message: His intended audience was Boston. He wants to go back. And he didn’t care if the bad optics offended anyone on his last day as a Net. Pierce wouldn’t commit to returning to the Nets after they lost their second-round series to the Miami Heat on Wednesday night, even though he said he wants to play one or two more years. Yet he had no problem earlier this season speaking at length about how he’d love to finish his playing days with the Celts. 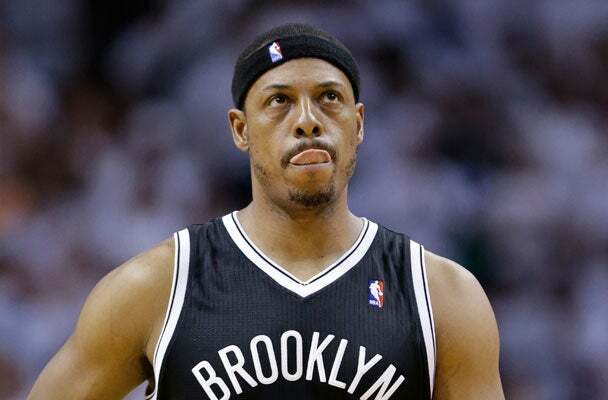 According to ESPN, Pierce might be interested in reuniting with Doc Rivers in Los Angeles. Coming back to Boston is possible as well, thought the Celtics have to get a lot of other ducks in a row first before they can know whether or not Pierce would be a fit. No matter what happens with Pierce, it’s becoming clearer by the day that the trade sending Pierce and Garnett to Brooklyn was absolute robbery.